The DECS 50/5 (Digital EC Controller Sensorless), available from Maxon Motor , is a new controller for driving brushless DC motors without Hall sensors. Typical sensorless drives such as pumps and fan applications can now easily be created due to modern technology and expert integrated controlling algorithms. Maxon Motor’s own in-house developed speed controller is particularly remarkable through its performance, price and size. The wide input voltage range of 10 to 50V means that the DECS 50/5 is flexible and adaptable. In continuous operation, an output current of 5A of the power stage is permissible, giving it a maximum output performance of 250 Watts – all this with it only being the size of a business card. The speed value can be set through an integrated potentiometer or an analogue set value. The 1-Q amplifier can be operated at up to a maximum speed of 80,000rpm. The new amplifier’s other important feature is that it can be easily adapted to specific requirements. The free choice of starting sequence is a major benefit, as it allows the attached motor to start up easily, even when the motor data or load ratios are unfavourable. The DECS 50/5 also provides control inputs for selecting motor direction, enable and braking. As usual, the necessary protective functions have all been fully implemented. An operating status display (LED) and speed monitor output complete the convenient control features. Plug-in screw terminals and a Flexprint connector for maxon flat motors are available for the connection. As manufacturers, Maxon Motor are committed to providing user-friendly products. 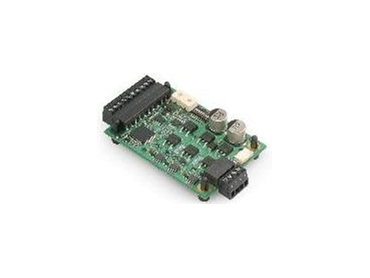 Consequently, the module can easily be used immediately in all applications because of its robust control design. Comprehensive operating instructions are provided with every order and can be downloaded from Maxon’s website.